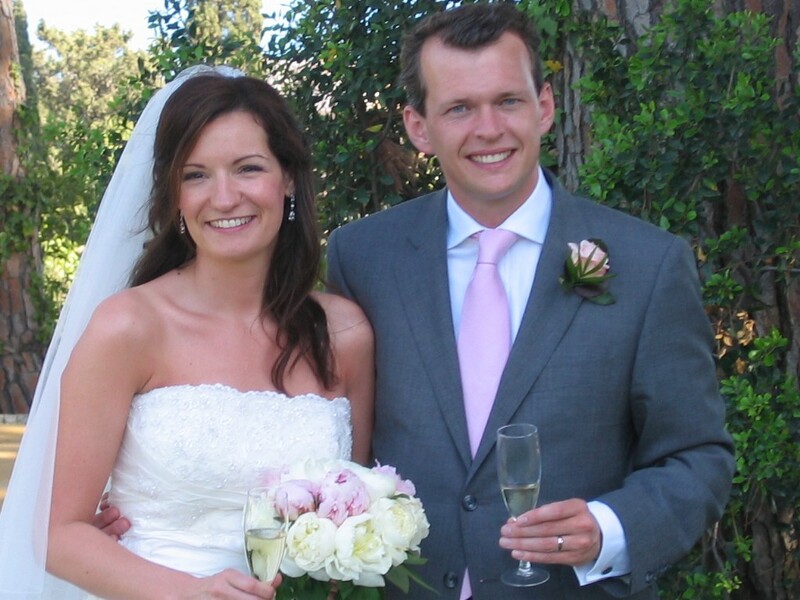 My last post about Spain…so sad, but at least it is a good one!The purpose of my trip to Barcelona was to attend my close friends’, Matt and Raquel, wedding (Matt actually spells his name with one “t”, but I think that looks funny so I stick with two). Matt and Raquel live in London, but Raquel’s dad’s side of the family is from Spain (her mom’s side of the family is from Scotland—where she grew-up). 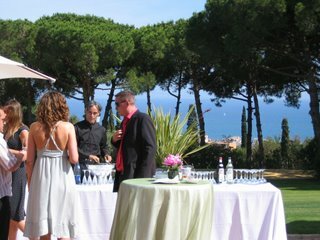 The wedding took place about 30 miles up the coast from Barcelona at a villa overlooking the Mediterranean Sea. As you can imagine, attending this affair was such a treat. Aside from the fact that it was the most beautiful wedding I have ever attended (except, of course, if I attended your wedding then this was the second most beautiful wedding I have gone to! ), the food was absolutely wonderful. 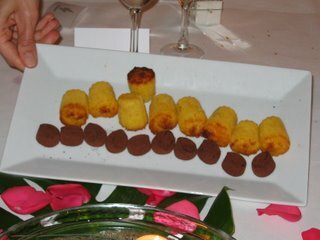 I also appreciated seeing how the cuisine is incorporated into Spanish weddings. How cool is this? 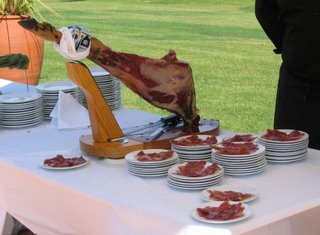 This is Serrano ham, which is very similar to Prosciutto in that they are both dry-cured hams (basically Serrano is Spain’s version of this Italian ham). Served near the ham was tomato bread. This is a very common way of serving bread in Spain. The Spaniards take raw garlic and rub it against the bread’s surface to pull out the oils. They then follow the garlic with tomato, which they also rub into the bread. 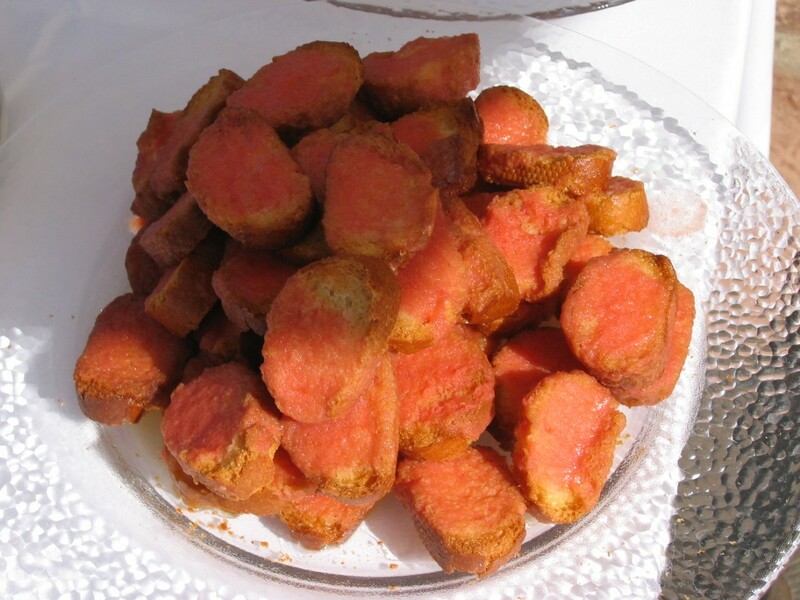 The final product is somewhat similar to brochette but with only the essence of the tomato and garlic. Quite lovely. That is a slice of Manchego cheese, which is a semi-firm sheep’s milk cheese made in the La Mancha region in Spain. 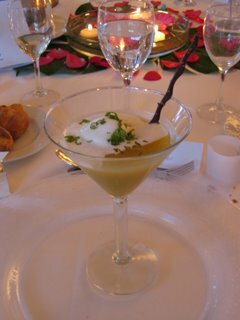 Its taste is slightly salty and creamy. To the right of that is a slice of bread with tomato and garlic, as described above. The next item is very fresh smoked salmon—so good! The next item is a mussel salad. You may recall from my earlier Barcelona posts that this region is well-known for its seafood. This salad was one of my favorite of the tapas dishes as it was very fresh. Next to the mussels are shrimp that have been broiled with seasonings. 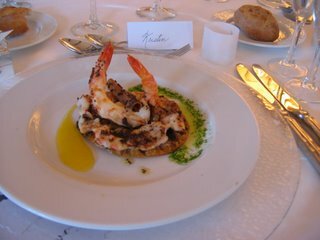 Shrimp is often common at weddings, but the seasonings used with the shrimp made these especially stand out. In the center of my dish is a slice of brie cheese topped with quince jelly, which Raquel explains is commonly served with cheese in Spain. Quince is a fruit that is related to apples and pears. 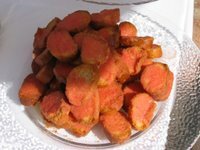 In its raw form it is too hard and sour to eat, but in its cooked form it can be used in jellies and preserves. Above my dish is a bowl of Marcona almonds, which are unique to Spain. Wow, now these are great cocktail dishes—and you know what? 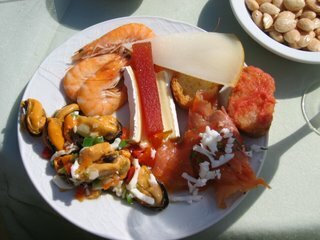 There were actually a lot more tapas dishes than these, but this was all I could fit onto my plate! 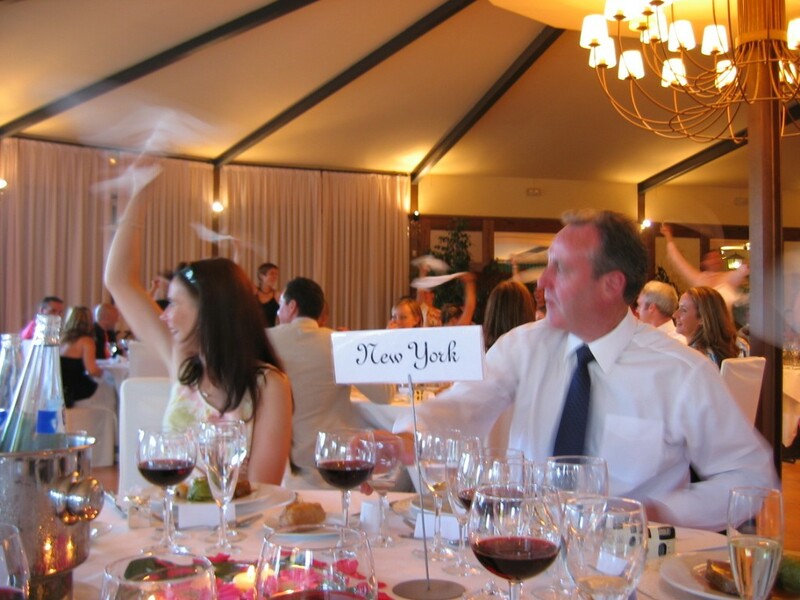 Between each course, the Spaniards (followed by non-Spaniards) would take their napkins and swing them above their heads to welcome the next dish. How exciting is it to be around people who celebrate food so much?! 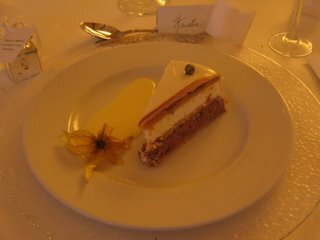 When it was time for the wedding cake to be brought out, the lights were turned off and the music went crazy. 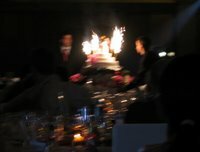 The cake was then wheeled out covered with firecracker sparklers. It was quite the scene and totally different from how we present the cake in the States! Matt and Raquel—thank you for letting me post about the food at your beautiful wedding! 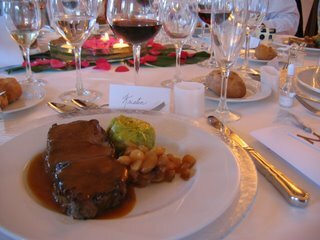 I do not usually like to post about meals that I am being treated to for I do not want the hosts to feel self conscience about my presence. However, it is rare that I have the opportunity to attend a foreign wedding and I wanted to share my experience. 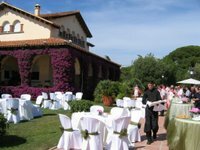 So I hope you enjoyed my Spanish series of posts! I had a fabulous time in Barcelona, and definitely recommend it as a destination. Enter your email address to subscribe to this blog. Note that the confirmation email that needs your response may go to your spam folder so be sure to check it.